Since 1984 Bigfoot Rafting has been the go-to company for tourists and locals alike. 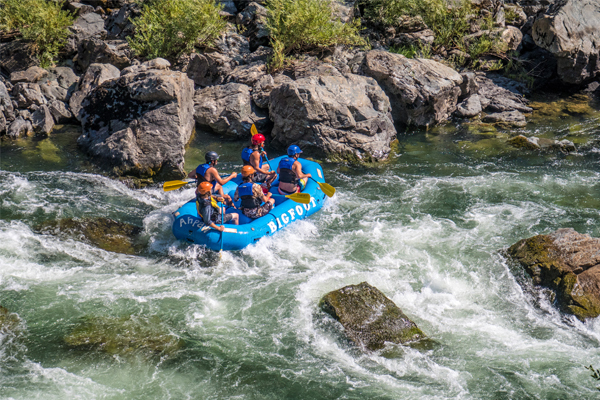 Thanks to the support of our community and loyal customers we have grown to be the largest and most experienced rafting company in Northern California. Not only do we offer daily trips on the beautiful emerald waters of the Trinity River, but we also love to journey out and explore the South Fork, Cal Salmon, and Klamath rivers. No matter your experience level or preference, we have something for everyone. Family trips, company trips, school trips, or special occasion trips- we do it all! Whether you want an action-packed whitewater ride or a calm gentle float, our guides will lead the way with their expertise, vast knowledge of the area, and love of the river. Always keeping you and your loved ones safety in mind, all of our guides are CPR, First Aid, and Swift Water Rescue certified. With our huge rental department we also have all the gear you need to have a memorable rafting experience all your own and we’ll even give you a ride there with our shuttle service. Come join the Bigfoot family for some river fun in the mountain sun!